Removing bad odors from your home before placing it on the real estate market is more important then most people realize! First impressions are critical in the realm of home sales, and you want to make sure that your home makes a positive statement from the start. As a former real estate agent, I showed more than a few bad smelling houses to house hunters, and no matter how beautifully presented, the buyers always walked away. Many home sellers think that they're removing bad odors when they spray artificial room freshening sprays and deodorizers, but these quickly fade and the problem is still there. Most people are suspicious of room deodorizers anyway, and will detect that underlying bad smell under an artificial spray. Instead of trying to mask it, locate the source of the offending odor and eliminate it. Smells trigger many kinds of memories, both good and bad! Boost good memories for home buyers by removing bad odors when you stage your home for sale. Sell your house fast by making it smell fresh and clean. Before a home showing or open house, avoid smoking in the house or cooking anything that has a tendency to linger in the air for days, like fried fish, cabbage, or cauliflower. Always use the kitchen exhaust fan when cooking. For quick odor relief, boil a cup of vinegar on the stove. Your kitchen will reek of vinegar for awhile, but this will quickly dissipate. The kitchen garbage disposal is a breeding ground for bacteria; try removing bad odors by freshening it with lemon halves. 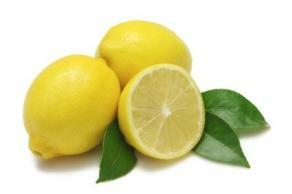 Throw a couple lemon halves into the running disposal. If this doesn’t help, pour 1/2 cup of white vinegar down with cold running water. Still stinks? Spray with an anti-bacterial cleaner such as, “Clorox Disinfecting Bathroom Cleaner,” or Johnson “Scrubbing Bubbles Bathroom Cleaner.” As a last resort, inspect the rubber ring around the opening. This ring is a gunk collector and should be scrubbed periodically with an anti-bacterial product. A stinky dishwasher - In an empty dishwasher, fill a cup with white vinegar and place it on the top rack. Run the dishwasher through a normal cycle. The refrigerator - Everyone knows this tip! Open a box of baking soda and place it in your fridge. Replace it once a year. Fill a bowl with vinegar and let it sit overnight in a smelly room to absorb odors. For a quick fix, pour white vinegar over a small towel, wring it out and wave it around the smelly room. Try removing bad odors by placing bowls filled with coffee grounds and orange peels in smelly areas. This technique is great for neutralizing odors. Place bowls under the sink next to the garbage, next to pet bedding, down the garbage disposal, in the bathroom, etc. Scrub out the kitchen garbage can often. Take out the garbage daily! 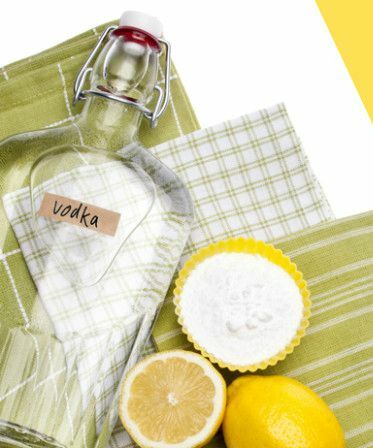 Add 2 parts water to 1 part vodka in a spray bottle and spray around a smelly room. Keep the window cracked in the bathroom to bring constant fresh air into the space. Scrub the inside and outside of toilet with your favorite bathroom bacterial cleaning product. Pay attention to the floor around the base of the bowl, as urine can collect there. (Ugh!) Wipe down the wall behind the toilet, as well. Clean the gunk out of the bathroom drains-- this can often smell bad. Wipe down the bathroom cabinets with orange oil or Murphy Oil Soap with orange extract to make the room smell nice and cabinets shine. Replace the shower curtain, as they can harbor bad smells. If you're home staging, treat yourself to a pretty new shower curtain! 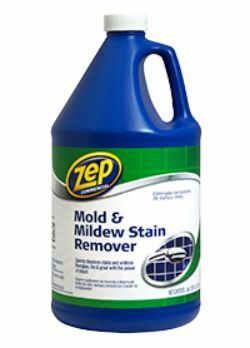 Remove mold and mildew smells by eliminating the source of the problem. See getting rid of mold for more help. If you have a persistant sewer smell, suspect a dry P-trap. This drain trap needs to have sufficient water inside to function properly. Shine a flashlight down the drain trap to see if there's any water inside. If not, continue pouring water into it until you can see it inside the trap. Go to Ask the Builder for more information on this problem. A P-trap is a plumbing fixture that has several purposes; It traps debris that has drained from the sink and prevents it from forming a clog deep within the plumbing system, and to stop sewer gases from passing into the home. Light pretty, subtle smelling candles instead of using commercial room deodorizers. These can smell artificial and leave a viscous feeling in your mouth. Avoid candles with a strong, cloying scent. 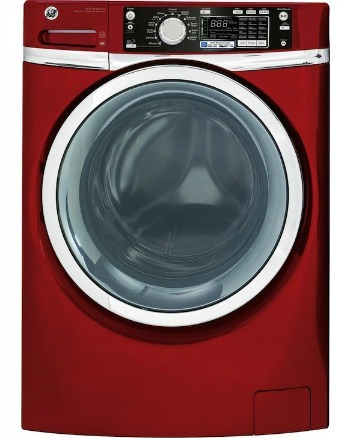 A free and easy odor tip for front-loading washers: Simply leave the washing machine door open between loads. Sure it doesn't look pretty-- close the door when company comes over!. The odor will practically disappear! This works for smelly top-loading machines, as well. Remember to close the door for home viewings. Washing machine - Removing bad odors from front loading washing machines is a real concern. The doors on the machines seal so tight that air cannot circulate inside, allowing bacteria to accumulate. Your clothing will begin to smell bad too! A cheaper home remedy is to run an empty wash cycle with 2 cups of bleach and hot water. One of the best cleaning tips for front loading washers (free too!) is to clean out the soap dispenser and rubber ring around the door of the washing machine. In my case, I'm always pulling dog hair out of the rubber ring-- gross! Follow the maintenance instructions in your owner's manual. My favorite all-purpose bacteria and virus killer is, Johnson Scrubbing Bubbles Bathroom Cleaner. It also removes soap scum and grime. After cleaning the gunk out of the rubber ring of the washing machine, spray on the cleaner, making sure to get into the crevasses of the ring. Let it stand for several minutes, then wipe clean with a wet rag or sponge. Be sure to rinse out all the cleaner from the crevasses in the rubber ring. Watch this helpful video below by eSparesVideo on how to clean your smelly front-loading washing machine. 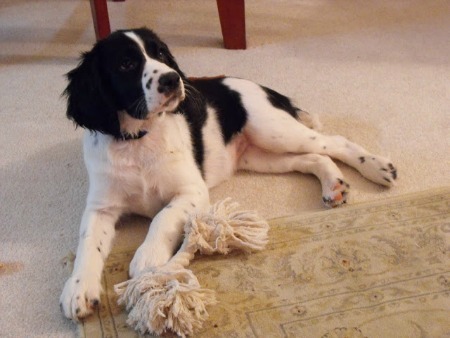 Meet Lucy, my English Springer Spaniel. Adorable 95% of the time-- not so cute after a roll in a pile of dead fish! Even when clean, pets have their own particular odors, so be meticulous about cleaning up after them. 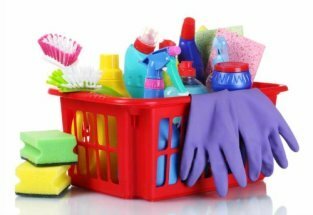 Keep cages spotless, fishtanks sparkling and litter boxes clean when you are trying to sell your home. Keep your carpets vacuumed and floors freshly mopped. Have your carpets professionally cleaned. Treat pet "accidents" with cleaners specifically designed to get rid of odors and stains. A couple good ones are; "Stink Free Instantly," available at Petco and "Get Serious" Extract. This extract actually removes pheromones in the odors so pets won't re-mark the area. You can find this product at www.petsmart.com or amazon.com. For cat pee that has penetrated the carpet, padding and into the floor below, there's only one solution. The carpet, padding, and often the flooring has to be removed and replaced. 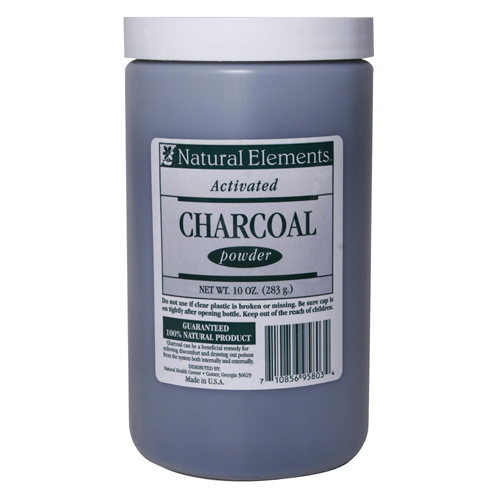 Activated charcoal is one of the best odor neutralizers available, and it’s very affordable. It works by absorbing toxins and other substances that need to be removed from the environment. Activated charcoal is a carbon that has been treated with oxygen, making it highly porous. It's used in water filters, medicines, home remedies and chemical purification. Make your own odor-absorbing activated charcoal hanger by filling cheesecloth, plastic mesh bags, and even socks with charcoal. Hang in any room that needs deodorizing. Or fill a glass jar or plastic container (puncture some holes in the lid) with charcoal and place near the source of the smell. Put activated charcoal near pet cages, litter boxes, garbage cans, diaper pails, gym bags, empty closets, smelly garages, attics, basements, smelly shoes, refrigerator, freezer-- you name it. Activated charcoal will last up to 2 months. Interesting fact: Activated charcoal was first produced for use as air filters in gas masks during World War I and II. There are many online sources where you can find activated charcoal, such as Amazon.com, or you can find it at your local pet, health food store, or the swimming pool supplies section of home supply centers. Heavy smoking will seep into your upholstered furniture, drapes, carpets, ceiling, walls, and even into your duct system. If you have cigarette build-up in your house, you'll need to scrub your walls and ceilings with a mixture of TSP (trisodium phosphate) and hot water. 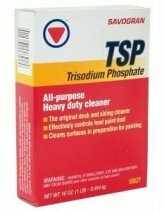 TSP is a powerful liquid that cleans, degreases and deglosses surfaces in preparation for painting. Mix according to the manufacturer’s instructions, sponging a small area at a time. Rinse thoroughly. Next, apply a fresh coat of paint to ceilings and walls to freshen the area. And please, smoke outside until your house is sold! Back before I knew anything about painting, I painted over some ugly yellow cigarette stains (left by the previous home owner) on the inside of my entry on the walls and ceilings. After the paint dried, I was horrified to see the yellow stains re-emerge! After a few phone calls and a trip to the hardware store, I cleaned the walls with a TSP solution and successfully completed the job. For cigarette-saturated furniture, air your upholstered furniture outside and give it a good shampoo. Let it dry in the sun if possible. Get smelly cigarette odor-infused drapes dry cleaned and carpets shampooed. For smelly garage floor oil spots, use a grease-cutting cleaner like “Goo Gone Grease Cutting All Purpose Cleaner” to clean. You can buy this product at amazon.com and most home improvement stores. Or sprinkle kitty litter or sawdust on the grease stains-- let it set for 24 hours. Sweep up, then wash with a power washer and/or degreaser to remove any remaining residue. Try to eliminate the source of the odor by getting rid of mold and mildew. If you suspect that you may have a toxic mold, like black mold, be sure to have mold testing done by an expert if it covers more than 10 square feet. Removing bad odors from clothing isn't always possible, but worth a shot. To remove smelly mildew, add 3/4 cup white vinegar to a load of wash. (No detergent.) Repeat if necessary. Do a final wash using detergent. Sometimes, just an old box of mildewy paperwork will make an entire room smell bad! I have had old stored boxes of books, children's stuffed animals, and paperwork become mildewy over time. Often you'll have to toss out things like this, especially books and papers. See getting rid of mold for more information. If your house continues to smell musty, you might want to check your air ducts and arrange to get them cleaned out. My brother once found dead mice and nests in his forced heat air ducts-- his family had been breathing this unhealthy air every time the heat came on! For overall household odor removal, watch the instructional video below by howcast.com.